As both George Santayana and Sir Winston Churchill said, "Those who do not learn from their history are doomed to repeat it." While Alex Padilla's Senate Bill 1530, which would have allowed a further erosion of teachers already ignored due process rights, was defeated in committee in Sacramento to the chagrin of Los Angeles Unified School District's (LAUSD) Superintendent John Deasy, the following video is a glimpse into the heart of darkness that Deasy has already empowered in the wake of the Miramonte child abuse scandal, that he continues to shamefully use to attack the vast majority of non-pervert and dedicated teachers, whose only crime is that they are: at the top of the salary scale; about to vest in lifetime health benefits under the rule of 80, which would cost LAUSD another $300,000 in unfunded benefits to add to the already $13 billion they already have; or are just trying to maintain rigorous academic standards for students, who find it easier to denounce their teachers than actually do the work they require. Check out the following video and tell us what you think...if you do think. Sadly, the protocol you mention is deliberately detoured because Deasy is less interested in the truth and protecting innocent children/teachers than he is in obliterating the expenses associated with them. Each teacher he destroys is worth about half a million in pensions, healthcare and salary. By ridding the district of costly veteren teachers and replacing them with their successful former students straight out of college and eager to work off their student loans, Deasy hopes to turn a larger profit now that Education is a business. Administrators have been encouraged to take out teachers. There is no rhyme or reason to it other than targeting those who cost the most and/ or have come close to obtaining the perks of the 80 rule. The ageism is rampant, so I encourage all teachers over 40 who are victims of this contractual con and caught up in the Kafkaesque nightmare to file complaints with the appropriate agencies. The more of us who follow through in this, the better. You are all to right about the profound damage your career has suffered. I myself have lost everything but my will to fight back, and I proise you, John Deasy and the dirty school board members will not forget me or you if we continue to pound away at their arrogant facade of self-rightous supremecy. Will they end up in prison where they belong? Probably not. But by the time we are finished, the world will know just what kind of low life run our schools and our city fo that matter. Stand tall. You are innocent. The CTC cleared me too, and I feel in time, I will be able to teach again if I choose to. I have dscovered there are other options out there besides. However, my priority will always be the welfare of our children and until the white calk criminals and EducRATS are removed from the districts and unions, I will not rest. Unfortunately this video is not an exaggeration. Students know that they have the power to get a teacher fired. In elementary school students who would rather stay home and watch TV or play the X-Box think that they won't have to come to school if theny accuse a teacher of hurting or making them uncomfortable. It has happened to me in the past. This student told his mom that he did not want to come to school because I screamed at him all day. It turned out that the student did not want Tto come to school because his peers were calling him gay. Another teacher at my school was pulled from class and questioned by police because a four year old child told his parents that the teacher pulled his ear. The parents wanted the teacher arrested and were pressing a civil suit. It turns out that the child admitted lying. The parents were going to proceed with the civil suit anyway. Deasy's directive is that teachers are guilty if a child says so. Children have too much power and some parents are looking to sue teachers or the district for money. I think the kid is a natural and willl be the next big stand up comic in a few years. I am pretty sure he is being toungue in cheek, and would never do such a thing . But at the core of every joke is usually some terrible truth, and while he may be dimly aware of it, he has articulated the very essence of what teachers face,. We cannot win. There are countless anecdotal variations of of our plight in blogs that are quickly multiplying in LA and in the the well established rubber room community our dear friend Betsy Combier has become the den mother for in NYC---there the practice has been defined by sociologists and psychologists as institutional mobbing. I have been through many ordeals, including being bullied throughout my childhood. I have always stood up for myself and as a scrappy little kid, I was famous for beating up boys 3x my size. If we had not move so often I would have never had to fight so much. I took abuse at home and at school, but nothing was ever as devestating as being grinded up by a bunch of mealy mouthed connivers who clearly had the district's blessing to malign me, my character and my hard work . I loved my work. I was very good at it . It was much much more tgan a paycheck to me. They not only stole that, they stained it with their excrement and hung it out like a flag for all to see. To read about so many teachers like Susan Shwartz, Lorna , Karen, Joel S. were literally destroyed by the lawless machinations of colleagues, administrators and these corpulent white chalk criminals does not alleviate that. It would be better if I was an anomoly, better if I was insane, but I know from my experiences in the rubber room that mobbing is a practice the public schools have no intention of ending . In one case close to me , a teacher was accused of sometjing, we never knew what exactly, by an 11 year old girl in class. He had been at the school many years and has a spotless record. I coukd see hevwas not a perv. . There are pervs in rubber rooms, and they are easy to ID . Most are open about what they did, the rest protest too much. This man was mostly worried about being arrested and his family. He did not eat or sleep fo a week. The incident was in all the papers even before he hit the RR. I research these thngs compulsively so I immediately recognized this was different. One thing stood out in reports: he was never named. We have to be savvy in the RR. The guilty teachers are typically treated much better than innocent teachers and have a much greater chance of cutting a deal or being returned to work. I know it makes no sense, not unless you understand LAUSD's priority which is spelled out and sanctioned in the CBA. That is to protect LAUSD from liability at all costs. This is inherent with the suits' interest in keeping cushy six figure jobs--- in fact, the entire purpose of most suits seem to be focused on CYA collectively. Thus the innocent become scaapegoats who are also potential litigants so the imperative is to discredit them by any means. The teacher and I decided after a week that he should go to police and surrender himself. He had hired an attorney we know is effective ( but expensive) , and he said not to bother because he had already checked.there was no case. Cops had no desire to question him. We assumed the child recanted or so dishonest cops realized she was lying. This is typical as many innocent teachers stand accused of criminal acts and never face law enforcement who in the Harbor area have a fairly good idea about the ethics of LAUSD . They know criminals when they see them. So the new detainee sighed, relieved and turned his attention to keeping his career. Just as he caught his breath, he was fired. No due process, not even the pretense of it the rest of us were afforded. As soon as he was pulled from the school angry parents descended as they are sick of having pervs dumped on poor hoods, but this teacher was not doing the lemon dance. He went to the hood as many donbecause this where he can do the most good. However, they soon realized that the superintendent Mike Romero, ( Parents conveyed most of this to me) was up to no good as he recruited victims and urged parents of the accusor to press charges against the teacher. Now he had reporters tracking him, and his family was humiliated as a few staked out his front door. News features kept popping up, a few vaguely asserted other transgressions. An adult at the school suddenly reported inappropriate conversation and sexual innuendos. A former student emerged with cryptic accusations of abuse according to allusions in the articles. I knew she was a ringer as colleagues told me how the supt came looking for her after going through records to get a kid who had had this teacher and also attended my school where his relationship with the principal has an insidous symbiotic quality. The original charge , for whatever reason, was never realized but this was never conceded. The girl's oarents had no desire to persue it. Most parents were complaining about the school leadership. The principal was removed soon after the teacher, and we hear fired which is very unusual. How true that is, I cannot be sure, but I do know the local superintendent trolled my school, which is in the same community as the teachers. This corrupt white chalk criminal and the personality disorder that was principal ( until his misconduct was so egregious it was impossible to let him remain---the 20 year beloved veteran teacher who provided evidence the suits did not dare ignore was rubber roomed a few days later for making death threats against this despot, as was I ) had colluded for years , comporting themselves like thugs. It is organized crime and RICO charges are overdue, but the media used the dubious info, keeping the, teacher's name out of the reports because they knew it did not add up. They are not interested in truth nor is LAUSD. Most reporters want to generate interest in their papers and blogs to ensure sponsors. But atnleast reporters are careful not to step in skander or libel. I learned from collegues that tge student was encouraged to say this teacher had touched her. She initially went along with this, believing, I assume, she would get a nice settlement. Then she came to her senses it seems. The police were not impressed, and later became annoyed when the supt. went back to the original accuser and encouraged her to press charges in the case cops never filed. This outraged the child's parents. If the the kid lied and was remorseful , one can see their reasoning. Because it is a closely knit little community, parents soon realized the district was up to no good. They were no longer interested in the teacher. They began to have meetings to discuss the district who they questioned. This should have been good news for the teacher, whose attorney, a very well respected and astute man who I send teachers to often, hired investigators and has realized an early asault on the local district leadership. If the district was not so delusional about its reputation and was prudent about the tax payers funding, they would have apologized to the teacher, transferred him to another school of his liking and it would have ended there. This is the case for most of us. We are not interested in litigation or reprisals. We just want our lives back. But LAUSD is a mob and it has one reptile brain that operates with cold cunning instincts. The teacher may not be interested in the hassles of a civil case, but he is the sort sort who would step up to help another teacher by sharing his experience with a court. For this reason, the district has an errant policy of no return. And then act like tgey ARE the victims l the real victim is so furious and frustrated, he or she gets aggrivated. Then the bully says, "See, she s crazy!" I am writing because I need your help in a confidential matter. I've been separated from LAUSD employment as a substitute teacher. after receiving an Inadequate Service Report in which an anonymous student made bogus charges against me. I feel like I've been living a nightmare and have had no meaningful help from UTLA. In preparing my defense, I've been reading your blog posts about the spike in kids accusing teachers since Miramonte and have a few questions about District policy as it relates to parents' right to be informed when their child is used as a witness to get a teacher fired. I appreciate any help you can give and trust this will remain confidential - at least for now. I have a week to finish putting documentation together for my CCTC Hearing and like a lot of what you wrote here. I can completely empathize with your situation. The exact same thing happened to me, I was falsely accused of misconduct by students and separated from LAUSD as a substitute teacher. To this date the district has yet to provided me with any evidence whatsoever supporting their position. My case is currently being reviewed for arbitration, but that is a very long process and it is unlikely that the Union will approve it. I just wondering what the CCTC hearing was and how it went for you. Thank you for your remarks. I guess you can say the CCTC hearing went well, inasmuch as they closed their investigation without prejudice. But this whole mess will follow me for the rest of my life. Unfortunately, every time I go to renew my credential, when they ask the question "Have you ever been the subject of a CCTC investigation?" I'll have answer yes and explain. I'm now in the process of appealing my separation. It's a mysterious process involving a secret Human Resources committee. I'm submitting about 100 pages of documentation as well as four letters from administrators who know me and 14 from teachers who've requested me. This alleged "incident" of my misconduct all happened during the week the Miramonte story broke on the news. The evidence the District provided me was anonymous statements by 6th graders. One of the kids went so over the top with his embellishments about my alleged sexual prowess. He made up details about me, my family, and my life as a teenager growing up. The language he attributes to me is the language of a sixth grader, not an adult. It says more about his hormones than me as a teacher, and ultimately, I blame the assistant principal who took the kid seriously and passed this up the chain of command and ruined my life. I worked with middle school kids for 15 years and know how kids lie. This administrator should have known how to interrogate a kid. She should have been able to see through his story and realize it was a prank. My old boss from when I worked at Hollenbeck said he couldn't believe anyone would have taken this kid seriously. What's seems to be missing from the whole thing is basic common sense. If the administrator had asked the kid some basic follow-up questions, his whole story would have fallen apart. I did learn that the LAUSD Board of Education has established Human Resources guidelines for this sort of thing. In my case, the protocol wasn't followed. In order for a student to accuse a teacher of misconduct, according to District policy, the kid must sign his name and declare under penalty of perjury that he's telling the truth. In addition, parents are supposed to be notified when school officials solicit a kid's testimony in any kind of legal proceeding. None of that happened. I have no idea who's accusing me. UTLA says my grievance will not be heard for up to two years, because of the increased caseload involving teachers in similar circumstances. (About 6000 were referred to CCTC.) In two years, the kid who slandered me will have graduated to high school. The AP responsible may have moved on. Chances are slim that anyone will ever be held accountable for ruining my life. I wish Deasy would impress on administrators the seriousness of following the District's own protocol when it comes to conducting their "investigation" of any alleged teacher misconduct. 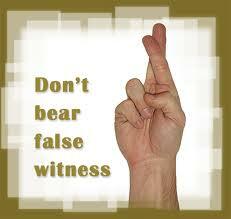 Especially when the record shows that teachers are falsely accused in 95% of the misconduct cases. Unfortunately, Deasy has a problem with Due Process. Miramonte could have been prevented if the administrators did their job. The same "tools" they have at their disposal, if used appropriately, will protect kids from predators. They would also assure that no innocent teacher's reputation gets dragged through the mud.